Have you ever noticed what happens to the employer’s contribution equal to the employee’s 10 percent PF contribution? Are you aware about the Pension Scheme inbuilt in the contribution to Employees Provident Fund.? All the employees who are working in private sector and from whose salary PF is deducted, might not be aware of the provision of the scheme. Employees Provident Fund and Misc. Provisions Act, 1952, provide for Pension benefits to eligible employees who have not completed the age of 58 years to become members of The Employees Pension Scheme, 1995. An amount equal to 8.33% of Wages up to Rs 6500 is pooled into the EPS from the Employer's contribution. i.e., If a PF member gets Rs. 1000/- as monthly wages and he and his employer contributes 10% each, Rs. 100 + Rs.17 (=117) goes to Provident Fund and Rs. 83 goes to Pension Fund. As such the maximum amount that will go to Pension Funds is Rs.541.45/- per month. I.e. 8.33% of Rs.6500/- .Govt. also contribute to this Welfare Scheme at the rate of 1.16% of wages. Valuating the Inflow and outflow to the EPS annually, each year Pension Relief is declared. How Calculation of Pension is done? Here, the formula of calculation of pension is similar to that of a Govt. Employee. i.e. Even though you may be drawing Rs.20, 000/- as salary per month, your company needs to contribute only Rs. 541/- towards pension fund. You can opt for commutation of pension and percentage of commutation. Maximum% of commutation is 33.33%. In this case, the pension will be reduced by 33.33% and you get 100 times of commuted value as lump sum. For example, If original Pension is Rs.1000/-, if opted for 33.33% commutation, the pension will be Rs. 667 and the lump sum amount is Rs. 333 x 100 = 33300. The commutation will not cease and the original pension will not be restored. If commuted, the pension after commutation will be taken as ORIGINAL Pension for the calculation of lump sum amounts related to Capital Return. If your total service is less than 9.5 years, you can apply for Pension Fund Money back (Withdrawal benefit). i.e., as you are not entitled for pension, you may withdraw that amount. The Withdrawal benefit calculation (as in the case of Pension Calculation) is depending on Average salary and total service, NOT related to your actual Balance in Pension Fund. 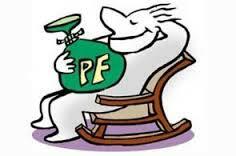 EPF Pension scheme is very liberal insurance to your life after job. In case you die before 58 years of age after contributing to EPF Pension scheme for at least 1 year, your family is entitled for Pension. You can add services at different companies by applying for Scheme certificate, and if your total service is at least 10 years, you can get pension from the age of 50 years on wards. For more details: Download Scheme.